The two plants that give their names to this chapter have no superficial resemblance but for all that they belong to closely-allied families. Purple Heather, popularly so called, is never purple, or has only a slight resemblance to that colour, and its claim to be called Heather is founded upon the slight fact that its size makes it look something like a Heath, and not that it is any relation. It is also called Purple Boronia, and for no better reason. This plant belongs to a small family of shrubs that appears to belong strictly to Australia, and even there does not extend to the warmer parts. It is rather close to the Pittosporum family; also to the Milkworts, a common English name applied to the group to which Blue Love belongs. Popular names are not always more understandable than scientific ones. 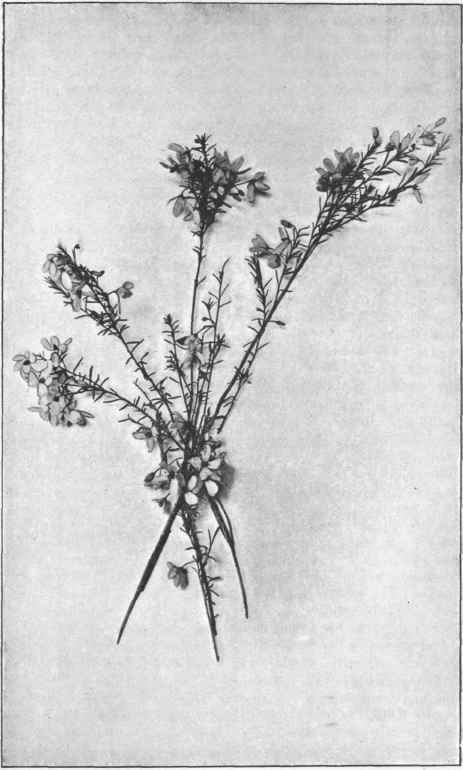 If we insisted upon using the title Milkwort, it would be meaningless to us except indicating to those with a knowledge of English plants that our Love creeper is of the same family. Purple Heather belongs to the genus Tetratheca. Why it is so called will be soon explained. We have about three species of Tetratheca in Tasmania. It seems obscure to say about three species, but we must remember species is not a fixed quantity or unit, but simply the nearest we think we can get. Even botanists do not all think alike; the result is they do not all agree as to specific limits. Some reduce our forms to two; others divide them into six. The flower is the same in structure and dispersal in all. There is one in each of the upper leaf axils. The stalk is slender, and the thalamus is not enlarged, so the. outer parts are inserted in regular succession close below the ovary. The calyx is formed of four small, separate sepals. The corolla is much larger and, except in dwarf forms, is about half an inch across. The petals are four in number, are free from one another, and alternate with the sepals. They are usually pink or pinkish mauve, but occasionally white. The stamens are of especial interest. There are eight arranged in a single row. Each is quite free from union with its fellows, but they stand upright in a circle round the pistil, and being dark, give a marked colour to the centre of the flower. The filament is very short, but the anther makes up for this by being relatively long. This anther is of peculiar structure. It is shaped like a slightly-bent club, and the surface, turned outwards, is rather larger than that looking inwards. If you cut through this anther and examine it with a magnifying-glass, you will find it contains two pairs of tubes running the length of the anthers; an outer pair rather larger, and an inner rather smaller. In these tubes lies the pollen. This four-chambered condition is the primitive form, and the anthers of nearly all flowers are four-celled when very young, only in most at maturity the cells have blended in pairs; in some, as in our Australian Heath family, all four have coalesced to form a single sack. But our Purple Heather retains the original four-celled condition. At the top the anther is very much prolonged, and is paler in colour. This elongation may be easily observed to be a tube open at the top. The anthers do not, as with most plants, split open at maturity, but the pollen escapes through the tube at the top. This form of the anthers has been used in suggesting a name for these plants. The genus is called Tetratheca, which means four cases or boxes. Four-cased anthers are not confined to this genus, however. The pistil is a very small, simple-looking object. It is oblong, and rather flat, and has a slender, simple style at its top. The ovarian part of the pistil contains two chambers, showing the organ to be made up of two blended carpels. In each chamber there is a single ovule suspended from the top. In fruit the pistil does not alter much in character; it only enlarges, and the walls become hard. At maturity it splits along each edge to allow the solitary seed to escape from each chamber. The prettiest of our Tetrathecas is T. ciliata, but untor-tunately it is only found near the north coast. It has relatively large flowers, and the leaves are placed four together, at intervals. Our commonest is T. glandulosa, so named because the flat leaves are rough, with little gland like asperities. It is very common even on dry hills. The other plant may be considered variable, or to be composed of two or three species, or united with the last, according to the idea of each student. Its leaves are narrow, with the margins bent back towards the centre, often some what hairy, from which it received the name T. pilosa. This plant on wet heaths and mountain plains is often much dwarfed, and smaller in leaf and flower. Blue Love is also often called Love Creeper, which is a more appropriate name, because the flowers are not always blue; they are sometimes white, and rarely pink. Young botanists should again remember that colour of flowers does not mark a difference of species. Though certain flowers are more or less restricted in this, for instance, no blue Rose or yellow Aster has yet been developed, yet probably all plants may produce white flowers. If a blue Rose or a yellow Aster were evolved, it would not be a new species, but only a garden variety. Though the flower of Love is so very different from Purple Heath, the structure of the pistil, fruit, and seed are so similar that they are considered to be very closely related. Love is a small creeper with few small leaves. By means of a twining habit it climbs up the undergrowth for 2 or 3 feet, and bears abundance of pretty little flowers, extensively dispersed, on its branches. Its habits is very much that of a parasite, but it is not one; it only clings to other shrubs for support. The flower is very irregular and difficult for the beginner to understand. At first sight it may be taken for a peaflower, but this is only a first impression, for it really is not at all like one; yet this has been seized on by examiners to catch an unwary student. There is not here the clear distinction of calyx and corolla we have hitherto met with. The calyx consists of five free sepals - three outer small ones, then two that are relatively large and spreading. They are coloured and look like petals, which they are commonly taken for. There are only three petals, the outer one of which is below, and is larger than the others: it is folded into a boat-shape, and resembles the keel of a peaflower. The two other petals are small, placed at the side, and partly united to the stamens. The stamens are eight in number; their filaments are united below in a sheath that surrounds the pistil. The anthers are very small. This pistil consists of two carpels that are blended together; the lower or ovarian part has two chambers, in each of which is developed a solitary pendulous ovule. The style is short and curved, with a relatively large two-lobed stigma. In growing into the fruit the pistil does not much change, except that it becomes larger and tapers below into a stalk. When mature it becomes dry, and splits along each edge to allow the two seeds to escape. The seeds are hairy, often copiously so. This is very marked in Love Creeper and its immediate relatives, and the genus from this has been named Comesperma. which means hairy seed. Love has also been named Volubile, from its twining habit. Its full botanical name is therefore Comesperma volubile. The genus Comesperma is also strictly Australian, but the family to which it belongs, namely, the Polygala or Milkwort family, is of worldwide distribution. We have three or four other Comespermas. The prettiest is Purple Broom. It is not a Broom, and it is not purple: but it is a very pretty shrub for all that, with numerous dark-pink flowers, reminding one at a distance of Native Indigo. There are also two insignificant little forms found in heathy country. These plants are evidently structured for insect fertilisation; probably by hover flies and small beetles. There is a large field of observation awaiting an enthusiast who will patiently study the habits of insects visiting our native flowers. It is very instructive to note the contrivances to insure the ovules being fertilised by pollen brought from another flower. The simplest measure is for pollen and ovules to be produced only on separate blooms. We have noticed this in Clematis and Manuka; it is much more distinctly the case in Sheoak. A more common way is for pollen and stigma not to mature at the same time. In Lobelia, Trigger Plant. Daisy, and a host of others the pollen is shed some time before the stigma is receptive. In Plantain or Ribgrass the stigma has passed its effective stage, and shrivelled before the anthers are mature. Another manner is for the anthers and stigma to be so placed that the pollen cannot get on the stigma by any ordinary means; this occurs in Violet, Iris, and Orchids. As a last method we may note that for some unexplained reason pollen may be incapable of effectively fertilising the ovules of its flower. It is possible this is the case with Gum and Wattle, but has not been enquired into. Now, it is very apparent cross-fertilisation must be of great value to plants, or how would all these measures to ensure it have developed 1 They are not a meaningless lot of developments that can be classed amongst the accidental, for they have a well-marked purpose. Crossing produces more and better seed. Under unusual circumstances it may be responsible for variation by the production of seed from rather unlike parents; but under free and unrestricted crossing it can only have the effect, of breeding out the unusual, and keeping the species oscillating about the mean. It will then be an effective means of suppressing variation and keeping the race close to a type. Crossing is not an absolute necessity with plants. Not only do many appear quite indifferent, but in some instances, marvellous as it may seem, special provision is made to prevent crossing. Some Violets only produce fertile seed in flowers that do not open and whose ovules can only be fertilised by their own pollen. The same often occurs in one of our Hibbertias. Further, in the enormous class of Fungi, in which there are already forty thousand described species, fertilisation of any sort is seldom known, yet they go on for generation to generation living their lives and doing their work, quite indifferent to the perfection of their celibacy.